the “box & toys” style it is pictured. Please note that you purchase the designs’ charts and their instructions only from me – if you wish to finish it in the same way as pictured, you will need to purchase the finishing instructions by Judy Odell. 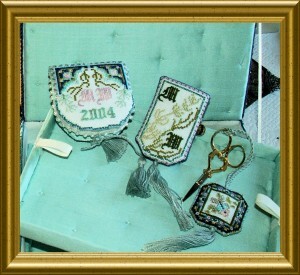 This design was a “joint venture” back then in 2004 and she did this gorgeous finishing. The lovely Mermaid sits on her rock, surrounded by treasures of the Sea. 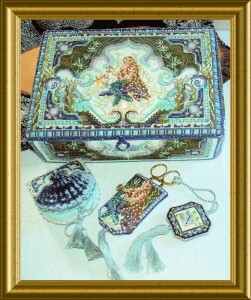 All sides of the box are covered with richly ornamented panels, you can work a “Shell case”, a scissors vob and a sheath. Use of plenty and varied threads, metallics, beads, crystals and Pearls makes the stitching as interesting as the different stitches aside the base of cross stitches. There are Special Stitches and even some Stumpwork – all is explained well with diagrams for help. A beautiful alphabet over one is provided, so you can personalize this embroidery. The size of the main design (box lid) is 161 x 112 stitches.